NEW AUX CABLE - GOLD PLATED. • High Quality Male to Male Gold Plated Cable. • Seamlessly transmits Audio: Provides high quality sound. 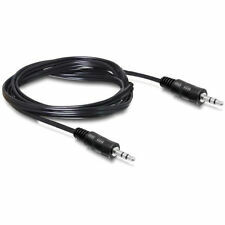 This cable will also connect your ipod / mp3 player to your car stereo via an AUX input. Connections: GOLD 3.5mm stereo Jack plug to 3.5mm stereo Jack plug. 3.5mm Stereo Audio Cables are specifically designed for quality audio applications. 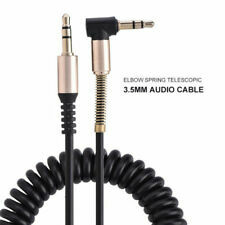 1 x 3.5mm Male to Male Spring Audio Cable. Connector: 3.5mm male to 3.5mm male. "L" type wire and spring interface design, avoid bending and inconvenience. Right angle allows you to reach tight areas where a normal straight connector is unavailable. NEW AUX CABLE - GOLD PLATED. • High Quality Male to Male Gold Plated Cable. • Random Colours. • Seamlessly transmits Audio: Provides high quality sound. Premium high quality spiral coiled aux cable used high grade PVC material and dual shielded cable for extra protection with 24k gold plated connectors to connect any 3.5mm device for great sound. Spiral aux cable works nearly all smartphones step-down design lets you securely use this cable with almost any smartphone case - Even if you have the heaviest and bulkiest case, you shouldn't have any issues inserting the cable and keeping it connected. Type: Car Auxiliary Cables Connection Type: 3.5mm Jack Plug To 3.5mm Jack Plug. Type: 3.5mm to 3.5mm male to male Cable. Color: white black. Superb Fit: Ultra slim extensions to the aux jacks enable use with pretty much any phone or tablet case (unlike standard aux cables). No need to remove cases during use. Compatible with the following headphone models. 1 x Bluetooth FM transmitter. - Support Bluetooth hands-free phone calling via its built-in microphone. - Bluetooth Version: V3.0 EDR. - FM Frequency: 87.5MHz - 108.0MHZ. - Audio Input/Output: 3.5mm audio interface. 3.5MM TO 3.5MM AUX AUDIO JACK CABLE LEAD. 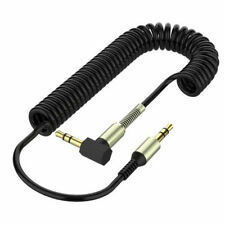 YOU WILL GET: 1 x 3.5mm to 3.5mm Aux Audio Jack Cable (As shown in the image). COMPATIBLE WITH: IPHONE 4G,4S,5G,5C 3GS, IPODs AND IPADs WITH 3.5MM AUDIO JACK. 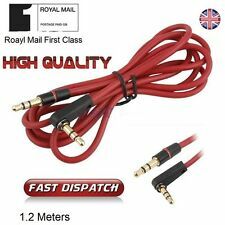 AUX CABLE FOR ALL AUDIO DEVICES AND CAR. We dispatch the item with in 24 hours (Expect Weekends) towards you. Built-in high-performance microphone with Noise Suppression (CVC) technology, grants crystal clear call while letting you drive more safely. - Wide Compatibility: It is compatible with Bluetooth enabled devices, like iPhone, iPad, iPod, tablet, smart-phones or MP3 player. Description: Premium Quality Colour: Black Car stereo system with AUX-Input jack. To enjoy your favorite music. Length: 100cm Cnnectors: 3.5mm Stereo Male to 3.5mm Stereo Male. Designed for using with CD players, stereos, speakers, headphones, PC/ TV tuners, for iPods and other audio devices with 3.5MM plug. Compatible with all Dre Beats, Solo, Studio, Pro HD,etc... Package Contents: . UM20 UM30 UM50. W40 W50 W60 W80 UM20 UM30 UM50 AM10 AM20. W10 W20 W30 W40 W50 W60 W80. Logitech UE900 UE900S; Westone UMpro10 UMpro20 UMpro30 UMpro50 W10 W20 W30. wire core 5N non-oxygen copper silver plated material. 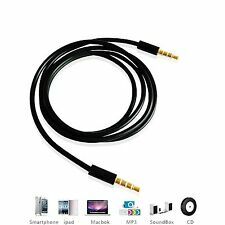 2M 3.5mm Jack to Jack Aux Cable STEREO Audio Auxiliary Lead For Mp3 Mobile Black. Logitech UE900 UE900S. Logitech UE900 UE900S; Westone UMpro10 UMpro20 UMpro30 UMpro50 W10 W20 W30. FiiO F7 F9 F9 PRO. Applicable earphone : FiiO F7 F9 F9 PRO; Shure SE215 SE315 SE425 SE535 SE846;. wire core 5N non-oxygen copper silver plated material. FiiO F5 FH1 FH5 F9 F9 PRO. Applicable to: (The standard MMCX interface is adopted to adapt the following models:). Length: 40cm. JVC HA-FX850 HA-FX1200. Shure SE215 SE315 SE425 SE535 SE846 UE900 UE900S. 40cm LC-3.5AS Headphone cable cord MMCX for Westone W10 20 30 40 50 60 80 AC10 20. W10 W20 W30 W40 W50 W60 W80 AC10 AC20. Applicable to: (The standard MMCX interface is adopted to adapt the following models:). 1M Aux cable to fit all audio devices that use 3.5mm. Male to Male Universal Black/Silver Plated Cable for Apple iPhone, iPod, iPad, Samsung, LG, HTC, Motorola, Sony, Google, Android, Smartphones & Tablets, Microsoft, Nokia Lumia Phones, Fire Smartphones & MP3 Players. This cable is universal, so can be used with all 3.5mm audio jacks. Great quality cables easily transfers sound from one device to another. Compatible with the interfece of: Senheiser ie8 ie80 ie80s/sony Fiio HiFiman(3.5mm). Material: 7n occ 15awg. 7n occ 15awg wire base weaving fine vinegar,very soft,no stethoscope effect the characteristics of the sound are very good.the sound is tightened.the strength is strengthened.the problem of low frequency dispersion and fat is solved.great cable for connecting a variety of devices and excellent sound.perfect for your needs. 2m SHIELDED OFC 3.5mm Jack Plug Aux Cable Audio Lead to Headphone/MP3/iPod/Car.